On a hot mid-August summer weekend in Richmond, Virginia, thousands of music lovers gathered for the seventh annual Richmond Jazz Festival. They picnicked, socialized and strolled around the verdant lawns of the vast, 100-acre Maymont estate, splitting their time between three concert stages that were filled with world-class musicians: Herbie Hancock, Stephanie Mills, Arrested Development, Diana Schuur, The Roots... Jazz, soul, funk, hip hop and other music genres created a euphoric party atmosphere and the fans loved it. 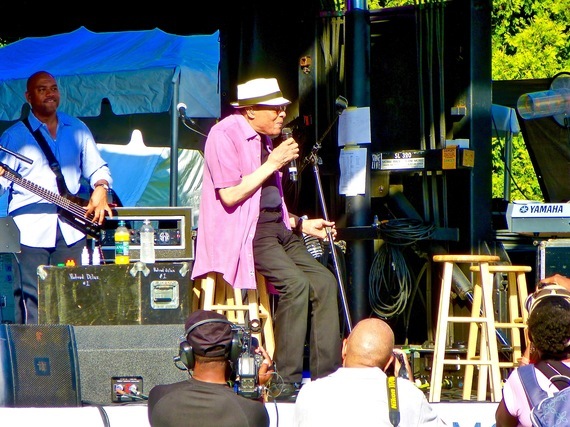 Al Jarreau on center stage at the 2016 Richmond Jazz Festival. As an intro, on Thursday night folks flocked to the weekly Dominion Jazz Café at the Virginia Museum of Fine Arts, which is sponsored by the Richmond Jazz Society. As the local jazz band Future Prospect played in the large open lobby, people sat enraptured. Between sets they wandered around the museum and viewed dazzling art exhibits like Gordon Parks: Back to Fort Scott and Kehinde Wiley: A New Republic. On Friday night the crowd moved to the Hippodrome Theater, a focal point of the historic African-American neighborhood of Jackson Ward, "The Harlem of the South" during the 1920s. Groups like Zhe' Aqueen, Kia Bennett, Loston Harris and Alvin Garrett worked the stage. On Saturday and Sunday the festivities began at noon and finished 'round midnight. The sun shone brightly and there was no hiding from the immense heat. Jazz fans gathered like they'd returned to a family reunion and paid the furnace-like 98-degree temperatures no mind. Smiles, handshakes and cordial greetings were common. The multicultural audience of young, old, black, white and others migrated between three outdoor stages: Virginia Is for Lovers Stage 1, for the main acts. Dominion Stage 2, for the more funky groups. Stage 3, for the intimate jazz sessions. Fans didn't have to choose between one act or the other. They could graze. They picked up their chairs and blankets and rolled their coolers wherever they wanted, past the soul food concessions stands, cigar lounge, wine tasting centers and pop-up boutiques. Then they settled in. Highlights of the Richmond Jazz Festival. The New: The local funk bank Chkn Grese inaugurated Stage 1. The very lively New York City brass band Lucky Chops acted like friendly frat boys from Julliard out to give people a good time. Their two saxophones, a trumpet, tuba and trombone didn't blare, instead they produced uncannily melodious sounds, almost like they were singing. Their gorgeous version of Adele's popular "Hello" was a high point. The R&B songstress Bri Luv and the young soul diva Tamara Wellons, both Richmond VA daughters, brought a classy presence to the Dominion Stage. Two divas bring style and spirit. Vanessa Williams, clad in a beguiling green jumpsuit and looking very elegant, performed with her band, which had been together since 1997 when they toured with Luther Vandross. She brought up her Broadway background (Kiss of the Spider Woman, After Midnight) as she artfully blended in some show tunes (Sondheim on Sondheim) with her memorable hits: "Save the Best for Last," "Dreamin'," and "The Sweetest Days." Stephanie Mills, who was on Broadway in The Wiz 40 years ago, showed off her body in a red dress and declared, "This is what 59 looks like." Everyone expected her to sing her hits like "I Have Learned to Respect the Power of Love." She did, and she pleasantly surprised listeners with her take on the Ed Sheeran love song "Thinking Out Loud": with lyrics like: "I will be loving you until we're 70." Mills, an adept crooner, was also determined to get the crowd dancing. She proved to be a formidable aerobics instructor when she bounced around the stage singing the bubbly "Never Knew Love Like This Before." She got the crowd up on its feet and their pulses racing. The '90s came back and everyone loved it. The Atlanta-based alternative hip-hop group Arrested Development, led by its founder Speech (Todd Thomas), rapped about politics and Afrocentric themes back in the '90s when other rappers were into gangsta posturing. They brought their smart brand of rap to Stage 2. Fans were bobbing their heads when they launched into "Tennessee." "Take me to another place, take me to another land..."
The group sang and started the crowd in the chant, "I.... am everyday people," a nod to the Sly and the Family staple which morphed into their classic song "People Everyday." Ever the philosopher, Speech told the crowd how he found the words for a new song, which is based on conversations he had way too many times. "People always ask me, 'Why don't I see you at the clubs anymore?' I say, 'Why don't I see you at the bank anymore?" Preach, brother. Just as you thought the market on hip-hop intelligentsia from the mid-1990s had been cornered, Wyclef Jean took the stage. He started his set rapping and free-styling in English, Spanish, French and Japanese. When he blurted out, "I don't bring no junk and I don't like Donald Trump," everyone screamed. It was on. Dipping into his trick bag, he played a guitar solo, with the instrument at his waist, behind his back, over his shoulder and finally plucking strings with his teeth. Milking the moment he had the audience sing the chorus of the Fugees Killing Me Softly. It was like feeding raw meat to caged lions. They ate it up! And for the few in the front row who weren't standing, he admonished, "Y'all in the front row are messing up my YouTube feed. Get up and dance." And they did. O Holy Night! When it was time for the seven-time Grammy Award winner Al Jarreau to come on to Stage 1, no one knew what to expect. His bandleader walked him out gently and Jarreau held a crutch under his arm. He sat on a stool, collected himself and started singing. Without acknowledging any specific ailment, he said firmly, "I'll do this from a wheelchair. I'll do it laying down." The audience roared its approval, as if they all came to the same conclusion: Older musicians never die. They continue to perform. With perfect timing and hints of improvisation he raised spirits on "Mornin'" and got folks in a romantic mood with "We're In This Love Together." Proving he could step up the pace he raced through "Boogie Down" with the verve of a young singer just starting out in the clubs. Taking a breather he revealed, "I'll be 77 this year." He acknowledged father time and reminded the audience that what they were seeing on stage is what awaits them one day. He wasn't apologizing; he was in full revelry. After all, he was the festival's elder statesman. Jarreau thanked people for coming out and searching for his music. He asked the audience to keep jazz alive by supporting it, buying tickets, purchasing records and attending jazz festivals. Tom Browne, who performed with Jean Carne, echoed his request. Browne, "Pass our music down to the next generation." That love of jazz and the urgency to keep it a vital part of American culture is why music festivals like the Richmond Jazz Festival are more than a celebration. They're a way of preserving an important indigenous American music art form. The 2016 Richmond Jazz Festival featured other artists like Esperanza Spalding, Morris Day and the Time, Ramsey Lewis and Buckwheat Zydeco. The wide variety of musicians and their faithful following were gathered together to keep jazz and its many offspring alive and well. On a hot mid-August summer weekend in 2016, once again Richmond, Virginia gave people who love jazz a place to call home. Visit entertainment and travel writer Dwight Brown at DwightBrownInk.com.